In this tale from the famous author a crew is on their way to the outer solar system when they discover something is wrong with their ship – something very wrong. SyFy has put out some new clips of the series debuting next month, and they only deepen the mystery. 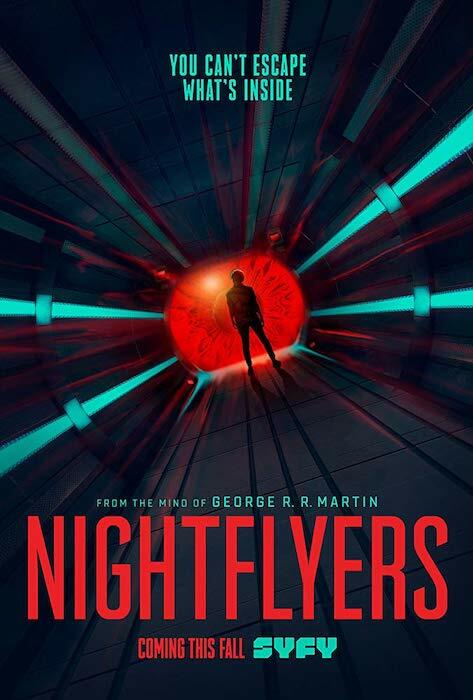 Nightflyers was published in 1980, and focuses on a group of maverick scientists and a telepath on a vessel going into interstellar space to find extraterrestrial life. The crew ends up dealing with a horror from within the ship instead. George R.R. Martin, describes it as “Psycho in space.” The novella inspired films that came after its publication – you can see some of them in the latest clips. Even though it came first, the series is going to have to prove it’s different enough to capture its audience. The novella is award winning, and it comes from the same brain as Game of Thrones, so it’s no like it’s random schlock. These new clips give a look at the characters’ terrifying interactions with the ship. The ten episode series is headed up by showrunner Daniel Cerone (The Black List, Dexter), with production help from Martin and Robert Jaffe (who adapted the novella into a movie in the mid 1980s). It stars Gretchen Mol, Eoin Macken, David Ajala, Sam Strike, Angus Sampson, Jodie Turner-Smith, Brían F. O’Byrne. Nightflyers premiers on SyFy December 2.